Great wines start from the ground up. Violent geologic forces and the steady march of time have created an agricultural Eden that produces some of the world’s most sought-after wine. 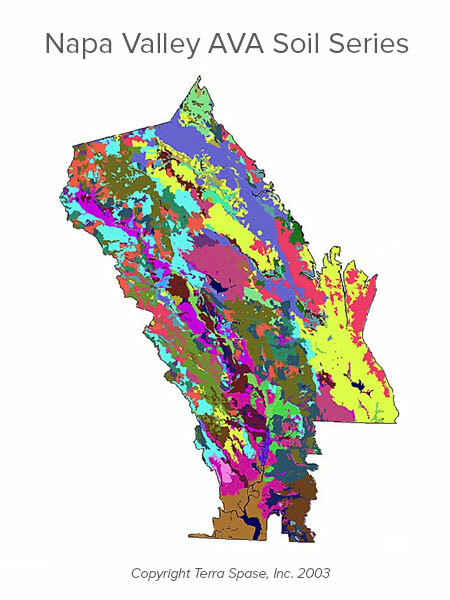 A vast array of soils of volcanic and marine origin coexist in Napa Valley, created by geological events that have occurred over the last 150-million years. The valley was formed by tectonic plate movement and volcanic activity, and the erosion and subsequent intermingling of this parent material has formed complex and highly varied soil compositions in the alluvial fans that emerge from the hillsides and spread out onto the valley floor. The most famous of these alluvial fans is the Rutherford Bench. Further stirring up the geologic pot were the periodic encroachment of San Pablo Bay, which once reached as far as the site of present-day Yountville, and the flooding and movement of the Napa River along the valley floor. The structure and composition of the soil greatly affect the character of the grapes and help guide the Napa Valley grape grower as to which rootstocks and grape varieties to plant. Each site presents its challenges and advantages to the winegrower. Valley floor soils tend to be deeper and more fertile and produce vigorous growth so the crop must be tightly managed to produce concentrated grapes. On the hillsides the vine has to struggle to survive in the spare, rocky soils and naturally sets a smaller crop, producing smaller grapes of highly concentrated color and flavors. Although Napa Valley is one of the world's smallest wine regions, it is also one of the most diverse. This video presents an easy-to-understand chronicle of 150 million years of the science behind the Napa Valley.